The 111 Urgent Care Centre in Croydon (near East Croydon Station) from late March onwards. These monitoring visits and will give you the opportunity to follow the entire process of receiving calls and the services offered to patients. Please let me know which dates you would like attend - morning or afternoon? We will try to accommodate you on the date you choose. When you visit you will be representing the Forum and you must be a member. You will be given a list of questions that you can ask and you will be expected to produce a short report after the visit. Please ensure that you can attend on the date agreed with you. The LAS Academy runs two year courses to enable Emergency Ambulance Crew and Technicians to become Paramedics. Part of the assessment and training requires the participation of people who act as patients (mock patients) for the trainees assessments. the trainee may need to perform some hands on assessment.This would be discussed and agreed in writing prior to participation. If you are a member of the Forum and would like to participate please let me know. It is a very enjoyable process. The training school is located in Fulham, not far from West Brompton and Earl's Court Stations. Members of Healthwatch can also participate if their HW joins the Forum or by joining as individuals. The mass of metal and timber, which was attached to a block of flats opposite the Royal Free Hospital, fell during high winds. Pond Street in Camden has been closed by crews from the emergency services since 14:50 GMT. London Ambulance Service said no injuries had yet been reported, but this could change. The Health and Safety Executive has been informed. The Royal Free Hospital said it was on standby following the collapse but it had not yet been required to treat any patients in connection with it. "We are continuing with planned appointments, although transport to and from the hospital is affected," a spokesperson for the hospital said, adding that people should allow extra time for their journey if they had an appointment. Organisation Code . Trust Type . Region . Organisation Name . Likelihood of White staff entering the formal disciplinary process . Likelihood of BME staff entering the formal disciplinary process . Relative likelihood of BME staff entering the formal disciplinary process compared to White staff. The WRES was introduced in 2015 to reveal and thereby help close the gaps in workplace inequalities between black and minority ethnic (BME) and white staff working in the NHS. 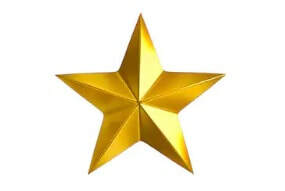 Getting this right is critical; evidence shows that a motivated, included and valued workforce helps deliver high quality patient care, increased patient satisfaction and better patient safety – it also leads to more innovative and efficient organisations. 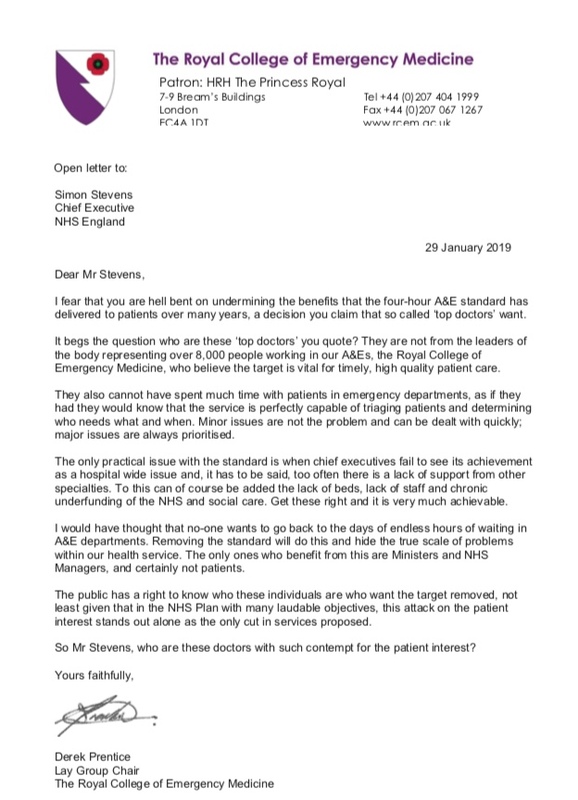 a) The LAS investigation is complete and that the CQC published their investigation report on February 7th 2019.
b) Stella Franklin from the CQC has kept the Forum up to date on this issue. to LAS premises and vehicles. A written response is still awaited. Are services at this Trust safe? Are services at this Trust well-led? 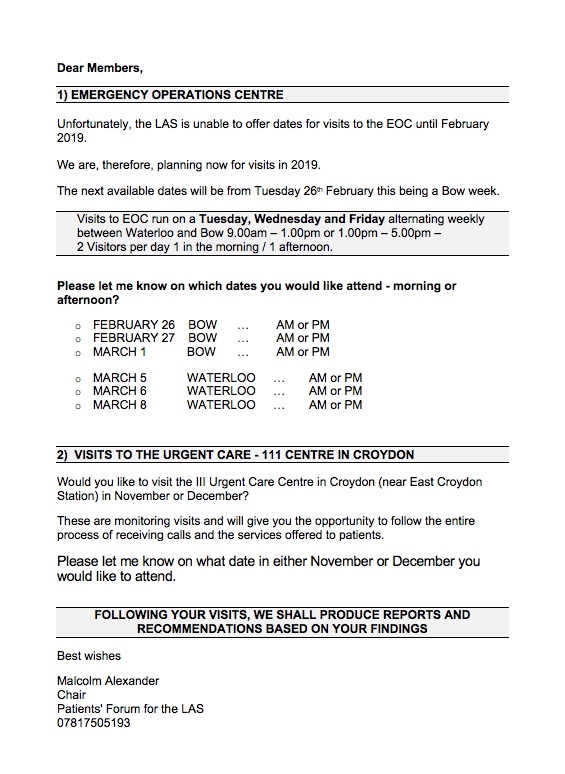 If you are a Patients' Forum member and would you like to visit the III Urgent Care Centre in Croydon (near East Croydon Station) in March please let me know. ​These are monitoring visits and will give you the opportunity to follow the entire process of receiving calls and the services offered to patients. Please let me know on what date in March you would like to attend. The visits will be for 3-4 hours. Meeting papers will be uploaded on 08 February 2019. Patient Specific Protocols are intended to help patients have conversations with their GPs or other healthcare specialists to design care plans that meet patients’ special or high level needs, should they require urgent or emergency care from the LAS. - please book a place at the URL below. 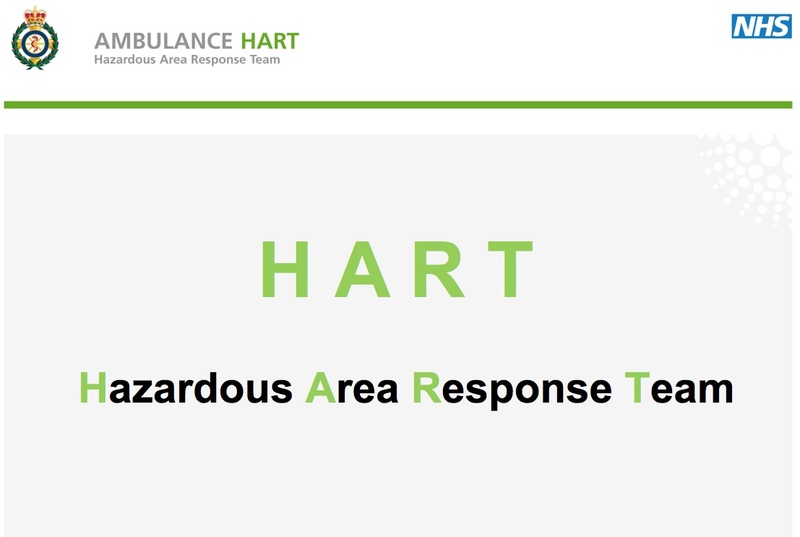 To provide rapid assessment and clinical care at the point of patient contact within the hot zone, maintaining that care throughout their extrication and/or decontamination. Defibrillators (Availability) Bill 2018 - more details belowThe Bill has had its First Reading and is due to be read a Second time on Friday 25 January 2019, and to be printed (Bill 308). ​click here or the sample below ... This is a sample, so change the highlighted areas to your own and send as soon as possible. The next stage for this Bill, Second reading, is scheduled to take place on Friday, 25 January 2019. This is a Private Members' Bill and was introduced to Parliament on Wednesday, 19 December 2018 under the Ten Minute Rule. If the text of the Bill is not yet available, please contact its sponsor, Maria Caulfield, for more information. maintenance of defibrillators; and for connected purposes. 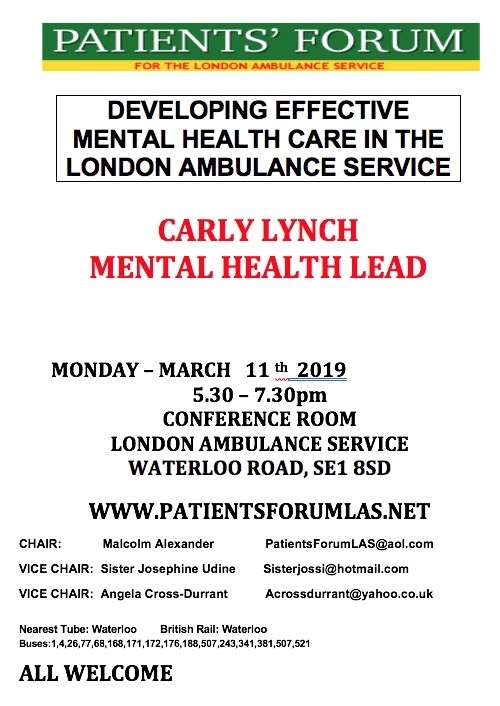 The Forum is an expert source of influence and information on the London Ambulance Service, and we hold monthly Public Meetings at LAS HQ, to which leading LAS staff, LAS Commissioners and other organisations, make presentations and answer questions from the public, patients and users (see list below). These Meetings aim to influence the quality, safety and access to effective urgent and emergency care services for people in London. We also arrange monitoring visits to the Emergency Operations Centre, ride-outs on ambulances and visits to other LAS services. 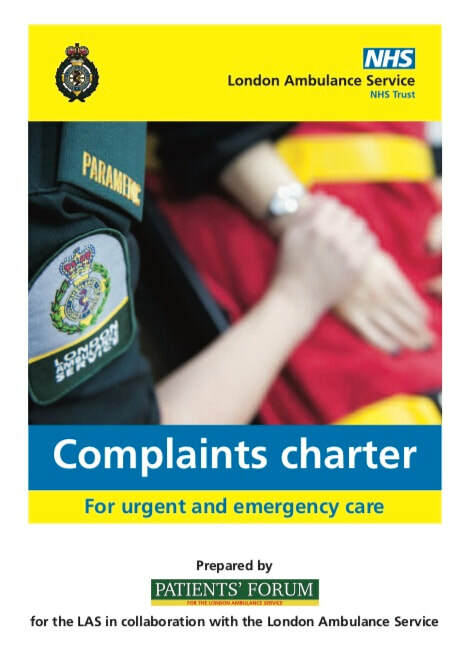 We provide support and advice to members wishing to raise issues, concerns, complaints and complements in relation to the quality of and access to ambulance services. Forum members also work closely with the LAS Academy to support the training of Emergency Ambulance Crew and Paramedics. 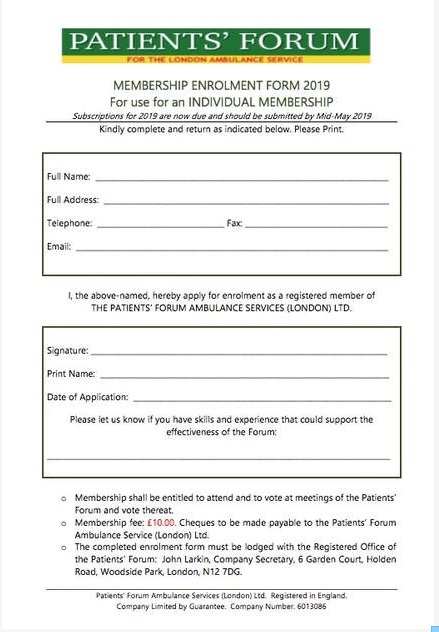 Would you be kind enough to let the Patients' Forum have your £10-00 membership fee (individual membership)? 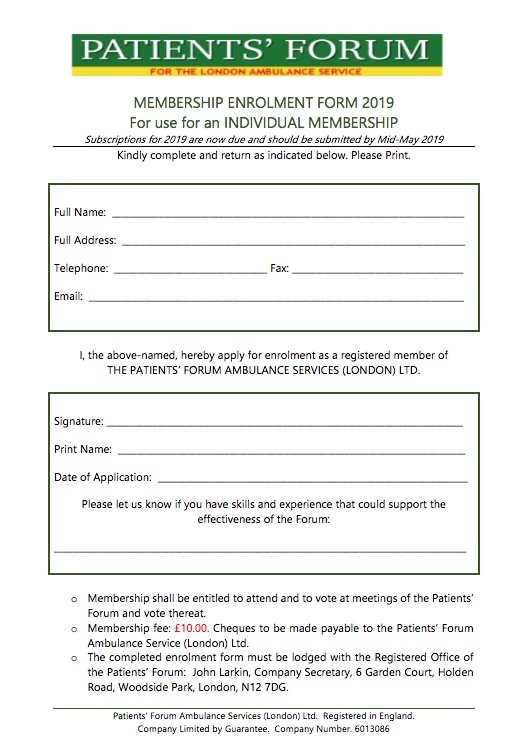 You can post it with the form below to: John Larkin, 6 Garden Court, Holden Road, Woodside Park, London, N12 7DG or bring it the next Forum Meeting. 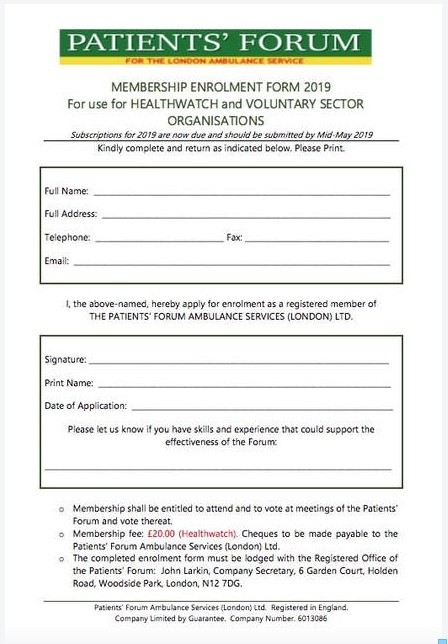 The Membership form can be found here for an Individual Membership, and here for a Healthwatch / or Voluntary Sector Organisations. The LAS Academy runs two year courses to enable Emergency Ambulance Crew and Technicians to become Paramedics. Part of the assessment and training requires the participation of people who act as patients (mock patients) for the trainees assessments. The process requires the mock patient to act as if they are ill, while the trainee questions them and assesses their condition. Limited physical contact takes place, except perhaps checking the pulse or blood pressure, and in some of the patient assessment the trainee may need to perform some hands-on assessment. This would be discussed and agreed in writing prior to participation. If you are a member of the Forum and would like to participate please let me know. It is a very enjoyable process. The training school is located in Fulham, not far from West Brompton and Earl's Court Stations. 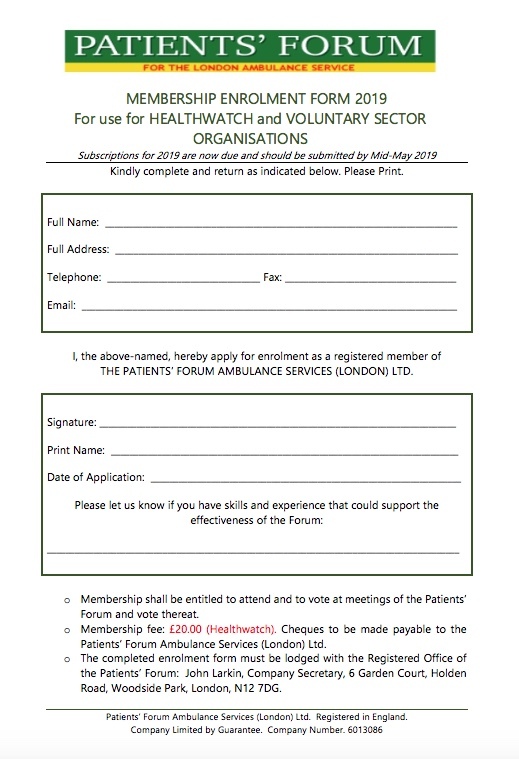 Members of Healthwatch can also participate if their HW joins the Forum, or by joining as individuals. My project looks at determining the accuracy of our current maternity triage and I’d like to invite a patient representative to provide feedback on the study design, questionnaires and promotional material I’ll be producing. I am looking for somebody who has previous experience of pregnancy and 999 telephone triage – is this something that you think one of your members would be appropriate for? Otherwise, if you have an alternative contact, I’d be happy to get in touch! 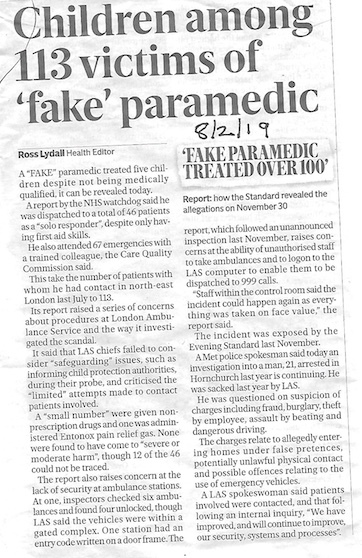 (020) 7783 2584 | EXT:182584 | Ayoola.Ariyibi@lond-amb.nhs.uk edit.